Get Connected has recently asked 5,000 children and young people under 25 across the UK about the issues they face in the modern world. 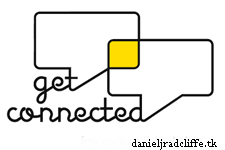 They have launched their full Connected Generation report 2015 now which features a message from Daniel in which he explains why he is proud to support Get Connected. Edit: Get Connected and YouthNet merged to form The Mix in 2016. I updated the link to the report above. It’s a great privilege to be able to support Get Connected as their Best Friend. Get Connected provides the UK’s only free,confidential helpline service specifically for children and young people under 25, who need help but don’t know where toturn. Over two fifths of children and young people have experienced depression and anxiety – that’s over 4 million 10-25 year olds. Growing up, I was very fortunate to have my parents and good people around me for support. This was invaluable when facing the challenges of public scrutiny from an early age, but the sad fact is that many young people don’t have anyone they can turn to for help if they need it, or they don’t feel comfortable reaching out for help. T here is still a social stigma to talking about some issues, especially amongst young men, and many young people are really worried that they’ll be bullied or laughed at if their friends find out. So they keep it inside. It’s vital that we encourage children and young people to reach out for support and know it’s ok to talk about issues they may feel embarrassed or scared about sharing. Alarmingly, of the 5,000 children and young people surveyed for the Get Connected report, two thirds feel isolated and lonely due to problems they have faced; shockingly one in five have experienced suicidal thoughts; 45% have been bullied. T hat’s a huge number of children and young people who are finding life very tough, and are at risk if they cannot find or access appropriate support. Many desperate young people are turning to the internet for help with personal problems, the need for young people to self-source help has been exacerbated by the closures and cuts to youth services. From the report we now know that the internet can do the opposite of help - this is especially true for young women, with over 50% telling us that they are more worried about their issues after looking online. Get Connected has access to over 8,000 trusted help services, and their website and helpline can ensure that young people access the best support for them, whatever the situation. There are many barriers for young people seeking help, talking about the issues they are facing is not easy and there’s a very real fear of being judged. I think it’s incredibly important for young men and women to know that they can reach out for support without fear of any stigma – Get Connected is a safe space to explore whatever you’re going through, with the chance to find further, specialist help as well. Over half of children and young people who took part in this study said that they would feel more comfortable asking for help from a free, confidential and non-judgemental helpline - and this is what Get Connected offer to anyone under 25 across the UK: a safe place to turn. I’ve been a supporter of Get Connected for over four years and I’ve seen first-hand how many thousands of young people they’ve been able to help, but there are many more out there struggling, alone and in need of support. T he number of young people who contacted Get Connected in 2014 saw an unprecedented increase of 53% from the previous year. I’ve pledged my support, and I really hope you can help too, vital funds are needed to cope with this surge in demand from children and young people who feel they have nowhere else to turn. You can become a Friend of Get Connected – visit www.getconnected.org.uk/donate to give as much as you feel able. You can also donate with a text - send GCUK25 £5 or GCUK25 £10 to 70070. To find out how to become a Get Connected volunteer and give 3 hours a week to support children and young people, no matter where you live in the UK, visit www.getconnected.org.uk/volunteer.